The enhancements will transform what is already one of the most popular theme park attractions ever created into what will feel like an all-new adventure. The newly reanimated, high-definition experience will unfold within the attraction’s towering visual spaces. 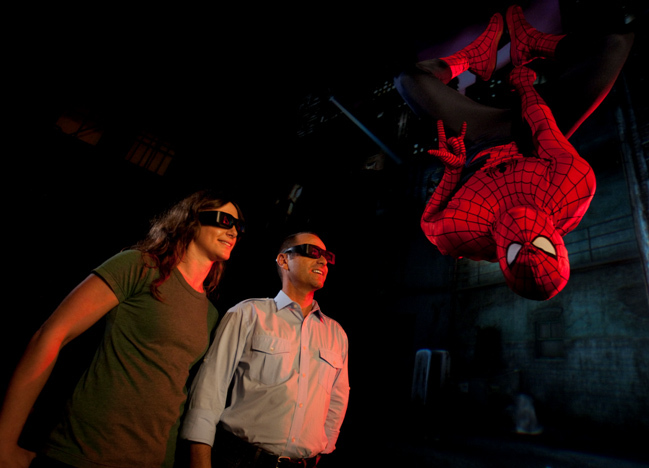 The enhancements will allow guests to experience details they’ve never been able to before – from the flames spewing from Hobgoblin’s pumpkins to the electricity arching through Electro’s body to the stitching on Spider-Man’s gloves. – Legendary comic book icon and Spider-Man co-creator Stan Lee makes a cameo appearance in the new film animation. – The action is more life-like than ever. Guests will actually see the movement of the characters’ muscles and the changes in their facial expressions. – The enhanced attraction features a new original music score. It is the same Spider-Man theme you love – with a rockin’ twist. – The ride vehicle audio system has been upgraded from 8-channel to 16-channel so riders will be even more immersed in the action. Guests will experience 3-D sound quality. – There are hundreds of cool new details for guests to discover in the attraction. Lighting, sets, graphics, props and even scenic detail have been updated to further enhance the animation’s tremendous improvements.